Jim Bowers along with Gaelen Adams wins an unprecedented 9th IC Nationals. 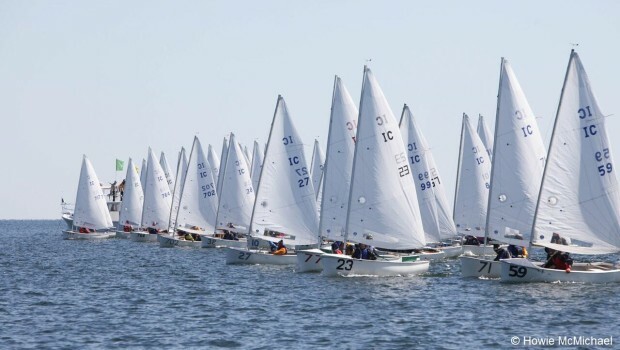 The regatta was held at the Metedeconk Yacht Club in NJ – 2015 Nationals Full Results. The 2014 Interclub Nationals was a regatta of the extremes! Port Washington, New York, the Manhasset Bay Yacht Club hosted the 2014 Interclub Nationals on April 5th and 6th. A front greeted the sailors on Saturday morning with wind gusts pushing into the mid to upper 20 knot range so the Race Committee postponed until 1:30pm. At that time the RC found a small window of time to get in two races in before the return of the “20 plus” wind conditions. Sunday’s conditions were quite different as the competitors sailed out to the race course in a light 5mph NW breeze only to see it die. A few waves of 2-4mph west/northwest breeze allowed the Race Committee to squeeze in two more races over the course of the day. 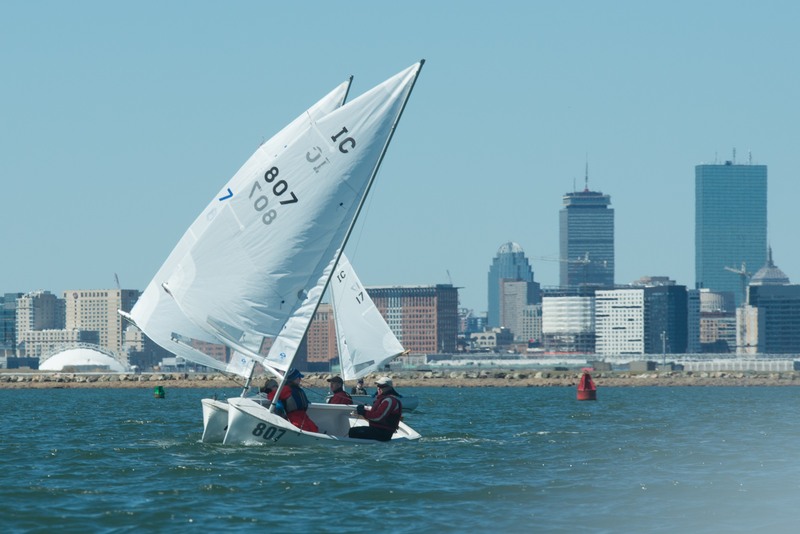 Jim Bowers/Alexa Schuler, from the Winthrop Frostbite fleet, were crowned the 2014 Interclub Nationals Champs. Dave Nelson /Julia Marsh, who are also from Winthrop, were 2nd and Paul-Jon Patin/Felicity Ryan, from Larchmont, were 3rd. Rounding out the top five were Steve Benjamin/Mac Christopher (Larchmont) in 4th and Pedro Lorson /Mimi Berry (Manhasset Bay) in 5th. Top Master (over 60) was Ted Toombs and Marianne Simms from Manhasset Bay. Saturday night’s activities included a barbeque dinner followed by a showing from Emmy award winning Thurston Smith on his documentary about “Frostbiting.” Following this presentation and some Q&A, some IC sailors found it necessary to go out into cold dark night and reposition some their fellow competitor’s ICs. The next morning, Interclubs could found inside the yacht club’s MBO room right next to the morning breakfast. 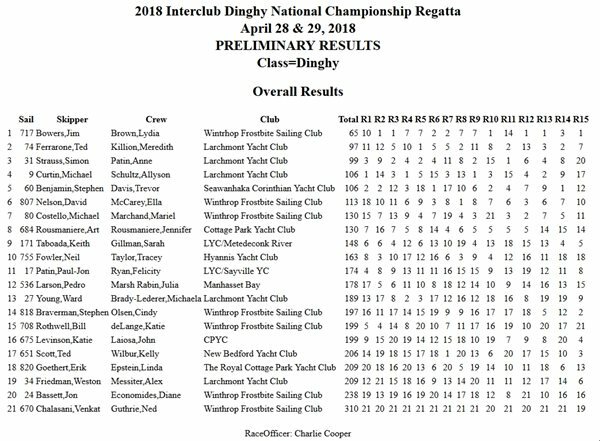 The Interclub Nationals was also the last leg of the Wharf Rat Challenge, whereby your best two results from outside regattas are combined with your results at IC Nationals. The 2014 winners were Paul-Jon/Felicity Ryan, 2nd was Ted Ferrarone/Meredith Killion and 3rd was Pedro Lorson/Mimi Berry. Jim Bowers and Alexa Schuler win the 2013 Nationals. With win number 7, Jim surpasses Jack Slattery for the most nationals wins. 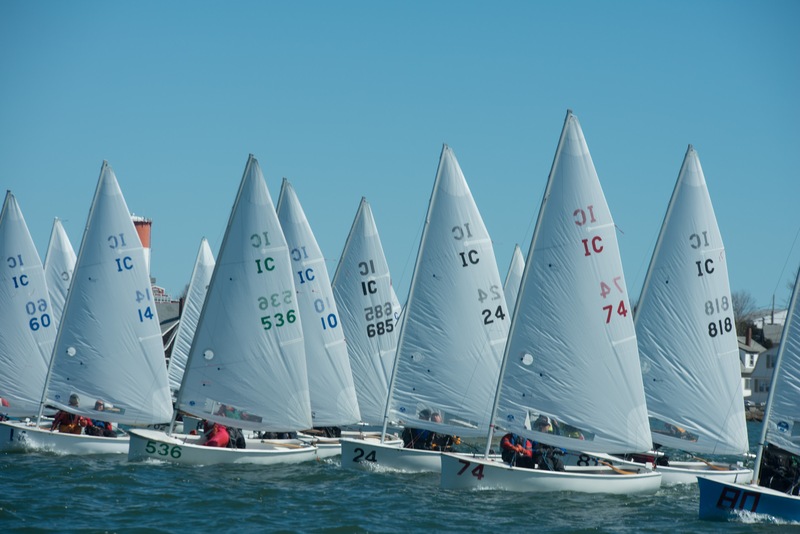 The regatta was a 15 race series held in beautiful Annapolis spring conditions. The nationals were held for the first time in about 25 yearsat the Rochester Canoe Club on Irondequoit Bay on April 28-29 and was won by Jim Bowers/Alexa Schuler.